A new image from the Hubble Space Telescope is an example of 'painting with light'. Astronomers use the separated colours produced by oxygen and hydrogen to investigate star-forming processes in the nebula NGC 2080. The colours explain much about the nature of such nebulae. The colours from stars, nebulae and galaxies come to us in bold strokes as if they had been painted by a renaissance master. But they are not artistic adornment, they provide details into the scientific workings of these objects. This new picture taken by the NASA/ESA Hubble Space Telescope demonstrates how astronomers can 'paint with light'. Light emitted by different chemical elements, and from elements at different temperatures is separated by special narrow-band filters to reveal the nature of complicated and violent star-formation processes. The Hubble image shows the nebula NGC 2080, nicknamed the 'Ghost Head Nebula' by astronomers. It is one of a chain of star-forming regions lying south of the 30 Doradus nebula in the Large Magellanic Cloud that have attracted special attention. These regions have been studied in detail with Hubble and have long been identified as unique star-forming sites. 30 Doradus is the largest star-forming complex not only in the Large Magellanic Cloud, but also in the whole local group of galaxies. The light from the nebula caught in this image is emitted by two elements, hydrogen and oxygen. The red and blue light comes from regions of hydrogen gas heated by nearby stars until it is fully ionised. The green light of the filament shape on the left comes from doubly ionised oxygen. The energy to illuminate the filament is supplied by a powerful stellar wind coming from a massive star just outside the image. 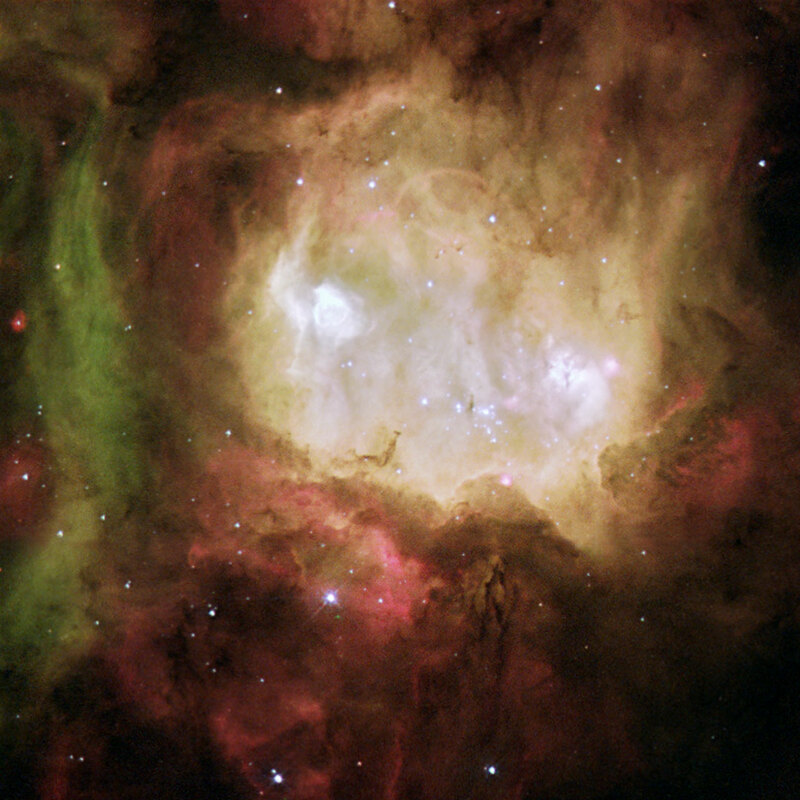 The white region in the centre is a combination of all three emissions, and indicates a core of hot, massive stars in this star formation region. The intense emission from these stars has carved a bowl shaped cavity in the surrounding gas. Two bright regions (the 'eyes of the ghost'), named A1 (left) and A2 (right), are very hot, glowing 'blobs' of hydrogen and oxygen. The bubble in A1 is produced by the hot, intense radiation and powerful stellar wind from a single massive star. A2 has a more complex appearance due to the presence of more dust, and it contains several hidden, massive stars. The massive stars in A1 and A2 must have formed within the last 10 000 years since their natal gas shrouds are not yet disrupted by the powerful radiation of the newly born stars. These results will be published in a forthcoming issue of the Astronomy and Astrophysics journal, in which the team behind the image describe the processes taking place in NGC 2080. The research team noted that Hubble's high resolution is essential in order to reveal the various features in the nebula, and to better understand the formation of massive stars in this interesting region. This 'enhanced colour' picture is composed of three narrow-band filter images obtained with Hubble's Wide Field Planetary Camera 2 on 28 March 2000. The colours are red (ionised hydrogen, H-alpha, 1040 seconds), green (ionised oxygen, 1200 seconds) and blue (ionised hydrogen, H-beta, 1040 seconds). The image spans 67 x 67 arc-seconds, corresponding to 55 x 55 light-years at the distance of the Large Magellanic Cloud (168 000 light-years). The scientists involved in these observations are M. Heydari-Malayeri (Observatoire de Paris, France), V. Charmandaris (Cornell University, U.S.A.), L. Deharveng (Observatoire de Marseille, France), F. Meynadier (Observatoire de Paris, France), M.R. Rosa (ST-ECF, Germany), D. Schaerer (Observatoire Midi-Pyrenees, France) and H. Zinnecker (Astrophysikalisches Institut Potsdam, Germany).